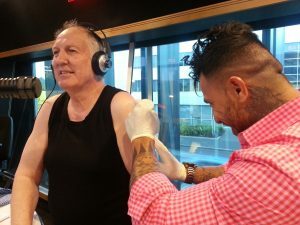 Gary (Gazza) McCormick the More FM presenter and famous New Zealander was tattooed by us this morning! Even though Gary’s lovely wife was not as keen on the idea of him getting a tattoo at the age of 62 he went ahead with it anyway and chose an anchor design to be tattooed on his arm by our Zealand artist, Mana! Zealand Tattoo was established in 1995 by prodigy tattoo artist Zane Swanston. We specialise in high-quality Maori, Polynesian and Japanese tattoo designs. As a studio we have tattooed a number of New Zealand and Australian top sports stars, including current members of the All Blacks, the Black Caps, as well as Super 15 players and volleyballers.